A coupling ring is a piece of jewelry which is exchanged between two people as a symbol of their love and affection. In most cultures, a couple ring signifies a promise of lifelong loyalty and devotion to one another. Therefore, they are also known as promise rings. While there are no set rules or rituals which you must follow while presenting your partner with a couple ring, here are a few things which you should keep in mind. 1.Although it lacks the sacred nature associated with an engagement ring, a couple ring should not be given in jest. Ensure that both of you are completely serious about your relationship and prepared to commit to each other. 2.Before you present a couple ring to your partner, make sure that you both are on the same page. He/she should not confuse the ring with an engagement ring, especially if the ring has a diamond. Otherwise, your partner might confuse it with a marriage proposal. Explain clearly what the ring symbolizes; if you want, you can also write a sample note explaining the significance of the ring. 3.You don’t need to plan something too extravagant while presenting the ring. You may invite your partner to a romantic dinner and present them with the ring or you can do something a bit more creative and unique. For instance, some people plan a scavenger hunt where the clues lead their partner to the location of the ring. 4.There’s no need to get down on one knee to you present a couple ring because it’s not a marriage proposal. You can simply put it in a beautiful box and present it to them. Usually, they’re given as birthday, anniversary, and Valentine’s Day or Christmas gifts. 1.Size: Before purchasing the ring, find out the ring size of your partner. Otherwise, all the effort will be for naught. 2.Price: Select your budget before you step inside the jewelry store. You can look at some of the rings available online to get an idea of the price range. Couple rings are cheaper than engagement rings. They usually start at $200 and may go up to $2500. 3.Design: Couple rings are made of different metals, such as gold, platinum, and silver. Select the metal of your ring depending on your budget and your partner’s taste in jewelry. In terms of style, you can choose from a number of options. Some of the common themes include hearts or other intertwined designs to symbolize the idea of a union, birthstone rings, and bands studded with a mosaic of stones. Sometimes people find it difficult to express their feelings with words. 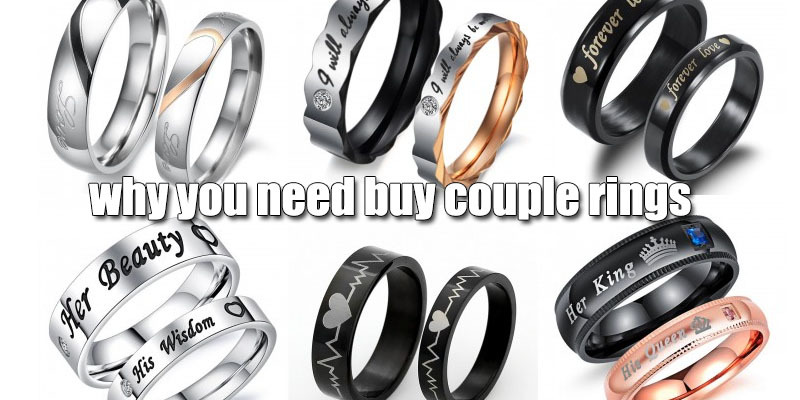 For such cases, a couple ring is a perfect gift to tell your partner what she means to you.